Jupiter Jones (Kunis) works as a cleaner with her mother, Aleksa (Kennedy), and her aunt. She has no prospects, no will to succeed, and no man in her life. Shackled to her mother’s Russian family, she is unaware that she is the genetic reincarnation of the matriarch of the Abrasax family. The Abrasax family are part of an alien race whose business is that of seeding planets and harvesting the inhabitants once they reach a certain physical maturity. The Abrasax matriarch had Earth as part of her portfolio, and its importance as a source of youth-giving serum is not lost on her offspring, Balem (Redmayne), Kalique (Middleton) and Titus (Booth). Each of them is trying to acquire Earth for themselves, and when they learn of Jupiter’s existence, they initiate plans to either manipulate her or kill her (or both). Jupiter can claim her genetic forebear’s titles and properties but if she does it will freeze out Balem and his siblings. His response is to send agents to Earth to kill her, but Titus sends a genetically engineered hunter called Caine Wise (Tatum) to protect her and bring her to him. Wise enlists aid of fellow hunter Stinger Apini (Bean) but a group of mercenaries manage to capture Jupiter and take her to a planet owned by Kalique. Kalique informs Jupiter that the conditions of her mother’s will were such that Earth would belong to her genetic reincarnation should one come forward. All Jupiter has to do is to claim her inheritance and her brothers’ plans will be thwarted. 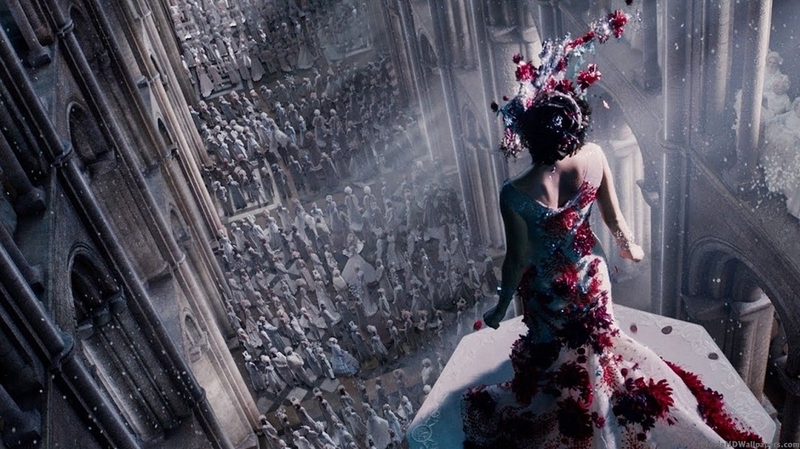 Originally set for release on 25 July 2014, Jupiter Ascending finally arrives on our screens and… is… well… just… terrible. It’s not quite as bad as, say, Teenage Mutant Ninja Turtles (2014) – that would be difficult – but it is shockingly, depressingly bad in ways that are completely surprising given the calibre of the directors, the cast and the crew. 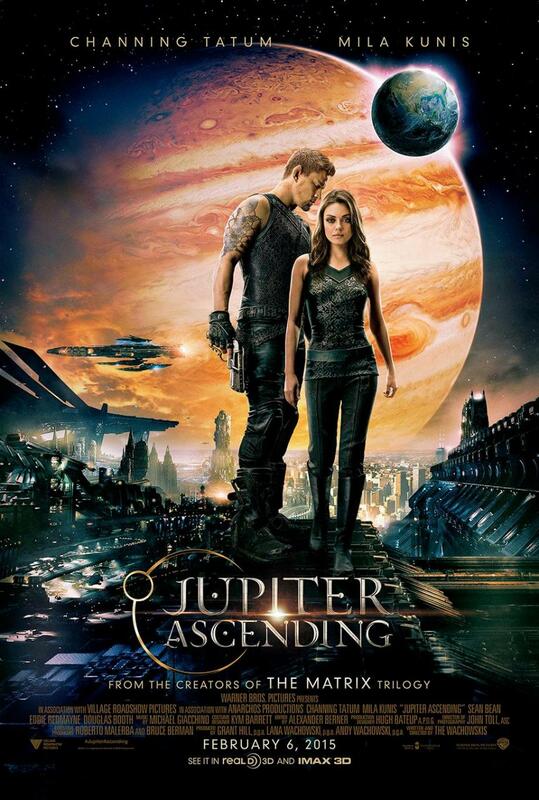 Already a box office bomb, with very little chance of its $176,000,000 budget being recouped any time soon, Jupiter Ascending is a classic example of what happens when you ask two feted filmmakers to come up with “an original intellectual property and franchise” – take a bow, Jeff Robinov (Warner Bros. president). The result? A movie that makes no sense at any point during its entire running time. There are plenty of other elements within the script that don’t make sense, such as the whole idea that Jupiter is the genetic reincarnation of the Abrasax’ matriarch. How or why this should even happen in the first place is skipped over by the Wachowski’s, and it hovers over the movie like a particularly stinky McGuffin. And the speed with which Bean’s character changes sides (and is forgiven) has all the dramatic intensity of someone changing their washing powder instead of their allegiance. It’s all in service of a script that careens from one unlikely scene to another while ramping up the visual spectacle to such a pitch that the characters appear incidental to the vast spaceships and the vast sets inside them (though the Wachowskis have seen fit to ensure that no room is too small that Caine can’t pitch and hover around it with ease). The cast look uncomfortable throughout, with Tatum doing his best not to appear confused (or wishing he was making another movie entirely), and Kunis unable to make Jupiter less irritating than she’s written. Bean appears to be apologising for each line he has to utter – his rhapsodising about bees is a highlight – while Booth mistakes petulance for silky menace, and Middleton is saddled with the weight of too much exposition (and wrinkles). And then there’s Redmayne, soft-spoken for most of the movie and evidencing Balem’s more psychotic tendencies by shouting loudly whenever he’s annoyed. By the end it’s become the movie’s most flamboyant performance, but it would have been better utilised in a pantomime than a science fiction movie trying to take itself seriously. The action scenes are suitably large-scale and ambitious but still rely heavily on the bad guys being terrible shots, and Wise being able to get off a kill shot from any angle. The Renaissance feel to many of the sets and the overall design is, however, impressive, but the production facility on Jupiter is too overblown, and seems designed more to be destroyed (as it eventually is) than anything else. And therein lies another problem, the Zack Snyder Equation™, which posits that if there is a chance to provide mass destruction on a monumental level then it should be grasped with every gigabyte possible. It seems movie makers still haven’t caught on to the fact that while this may make for an arresting visual sequence, we’ve still seen it way too often now for it to have any meaningful effect. Rating: 4/10 – with stumbling, forlorn attempts at comedy thrown in here and there – “I love dogs”, Jupiter’s Russian family, any time Famulus (Mbatha-Raw) makes an appearance – Jupiter Ascending succeeds in undermining its own credibility at nearly every turn; a space opera masquerading as something more (though exactly what is hard to determine), this sees the Wachowskis reprising themes from The Matrix to less than impressive effect.